We woke again before sunrise to the magnificent, orchestral sound of the dawn chorus. There was such variety in the calls that you could just lie back and try to decipher all the different layers of sound. 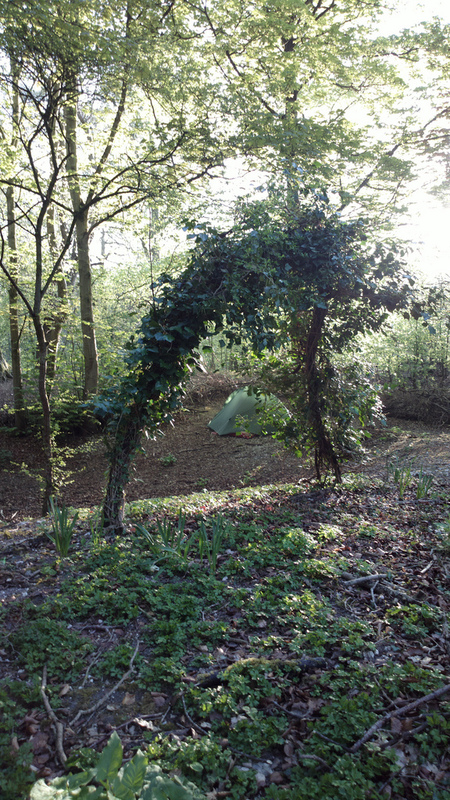 We dozed for a while and then I ventured out to explore the woodland in the golden sunshine and found the little dell where we’d pitched the tent was framed by a tree arched over to form an almost heart shaped outline. 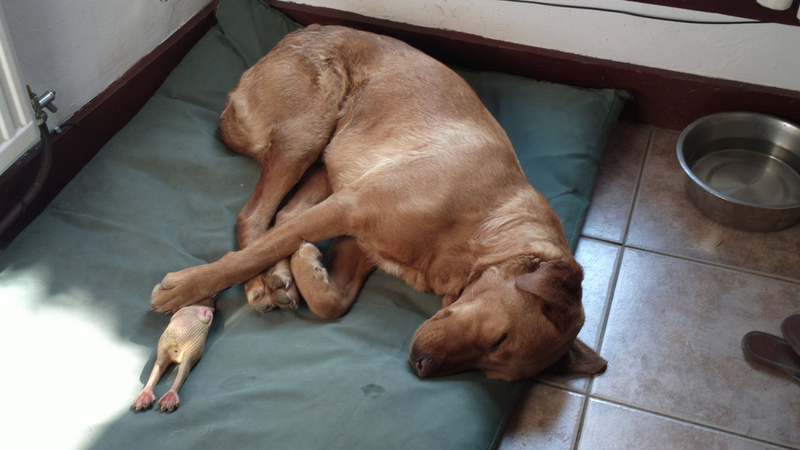 I brewed apple mint tea for us on the camping stove and we drank it in the tent, with Bonzo snuggling under the unexpected treat of my down sleeping bag, which I let him borrow in a moment of weakness. We cleared away the camp, leaving no trace but the slight shadow of where the tent had been pitched on the bare earth and wandered back into the village just in time for the opening of the village shop, The General Store. 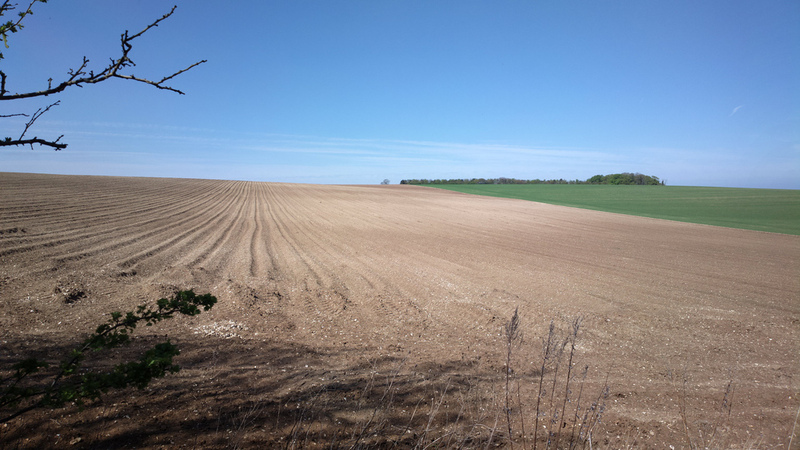 It was already a hot day and we wanted water and supplies before setting off further south on the Peddars Way, where villages to stop and refuel would be less frequent. The shop was a warren, with rooms and alcoves spread across two levels, selling everything from gifts and pet food to a fine selection of local ales and freshly baked croissants. We ate ours, and some bananas, on a bench in the sun, where Bonzo’s rucksack continued to attract attention from the locals. One lady, a very country sort of a person in a sleeveless wax jacket, armed with a whistle made from bone and a lively Jack Russell terrier, was sufficiently moved to offer him a treat from her pocket. 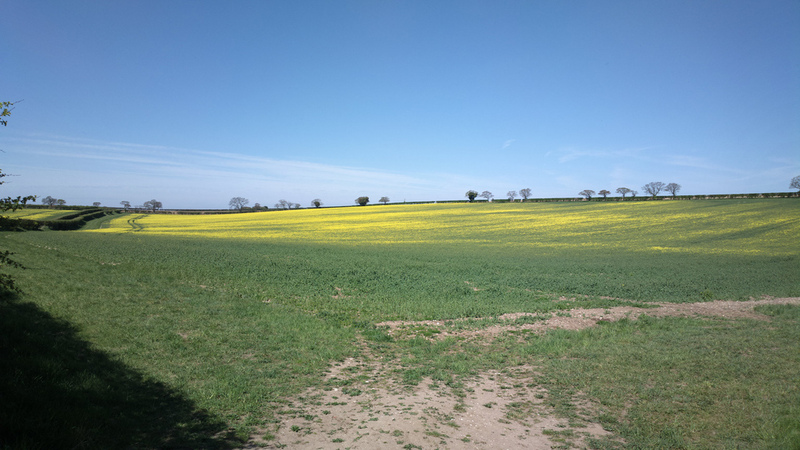 From Ringstead the Peddars Way can be seen running south as a dusty golden trail through green fields, rising up and down the gently rolling hills. It felt different from the coast path, with the heat of the day arriving quickly and no fresh winds from the sea to blow it away. 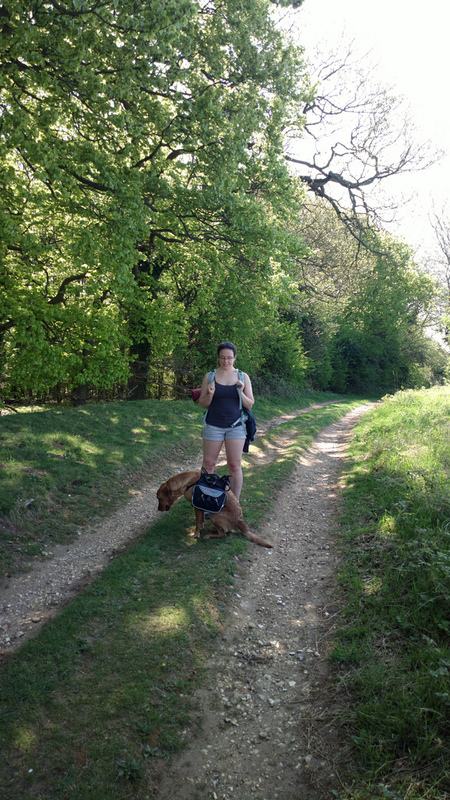 We walked for about an hour at a time, stopping to give Bonzo water and a rest. Despite the attention it was garnering, he clearly did not relish walking with his rucksack and was starting to drag behind, looking questionably at his paws as if to imply they were no longer working. We started to carry the rucksack for him, but he was still lagging behind and Michelle’s feet, bad the night before, were getting worse. 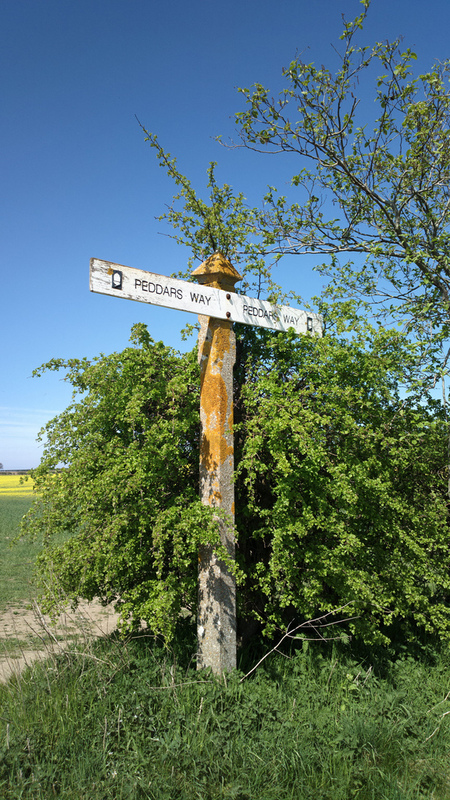 The Peddars Way feels like an old trail. To either side the fields stretch for miles and occasionally it cuts through a green tunnel beneath a copse of trees. 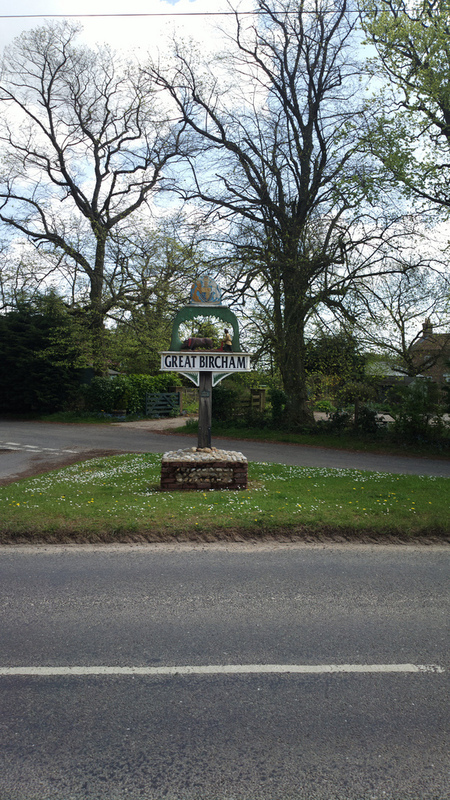 We decided Great Bircham would be our end point before heading home and turned east from the Peddars Way, down another long sandy lane, towards the village. We found the Kings Head Hotel on the High Street and enjoyed a fine lunch. The portions were generous and the food delicious. We sat on their patio, Bonzo absolutely sound asleep under the table, and listened to the first few songs of the acoustic guitar band which was playing for the afternoon. This was a journey to find new experiences within the known bounds of our local area, something we have been eager to do ever since we moved to the area last year. It taught us two things. Firstly, that this is a coastline of beautiful variation, from pine forests and dunes to open marshes and gorse heaths, all within the space of a few miles. Beneath the golden sun and blue skies of the bank holiday weekend, it felt like the finest place to be. Secondly, that the pace of journeying by foot affords you the opportunity to discover new richness in a familiar landscape – an experience which refreshes deeply, as a holiday should. If you missed them first time around, you can find episode one here and episode two here.